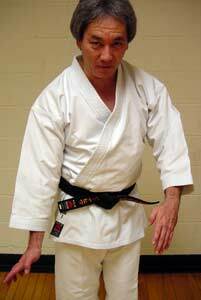 Editor's Note: This is the second in a series by George Donahue on the koshi/yao, body segments used to develop power and speed in old Okinawan Shorin-ryu karate the basics of which have been lost to most modern practitioners. All good martial techniques arise from the koshi, or yao, but you can’t effectively use the koshi/yao without proper training. Here are a few of the basics. There are probably an infinite number of foundation exercises that will enable you to improve the strength and facility of your koshi/yao (from here on, for simplicity, we’ll just say koshi, rather than koshi/yao), but you need only a simple set to get a good start. If you perform the following set with every workout, you will gain better control of your koshi in a short time and all of your techniques will improve measurably. The first exercise to develop basic strength and, particularly, control of the koshi is what we like to call "making change." For this exercise, you must imagine taking a large coin (an American quarter or a Japanese ten-yen coin would be about right) and placing it sideways between your buttocks—not too deep, though—squeezing and holding it in place for the duration of your training session. If you aren't able to imagine this consistently and without lapsing into inattention, you should forget the imagination and sacrifice a real coin, for a while, at least. For most people, imagining is enough. Once you’ve got the coin in place, bow in your usual manner to begin the workout. The most important consideration here is to never drop the coin. When the workout is over, bow to end the session and let the coin fall until next time. From opening bow to closing bow, the coin stays in place. Although we focus at first on making and keeping the contraction with the buttocks, we need to add, as soon as we’ve mastered that, a contraction of the front part of the lower abdomen, too. This contraction is the same as the Kegel exercise taught by physical therapists and childbirth educators. There are good explanations and guides to performing Kegels on the web, starting with the introductory article on Wikipedia (http://en.wikipedia.org/wiki/Kegel_exercise). With the coin visualization, the Kegels, and the following exercises, you should eventually be able to maintain a dynamic contraction of your entire lower and middle abdomen. The second basic exercise develops strength and control, but also refines and corrects your stances. These are also called “arched squats.” For this exercise, you do squats in almost the normal way—with a single, big difference. With a normal squat, you allow your ankles, knees, and the juncture of the femur and the pelvis to act as hinges. With a distortion squat, you try to maintain all those body parts as arches, keeping the hinging to a minimum. Think of your body as a fire hose with a three-inch or so diameter. Imagine intense water pressure and a powerful stream flowing through the hose. If you allow a hinge in your body, that is the same as putting a kink in the hose. You’ll be restricting the flow of your power and energy unnecessarily. You can’t get anywhere near as low with an arched squat, but it does you more good than a hinged squat. To compensate for the lack of depth, hold the squat at its lowest position for ten to twenty seconds. I sometimes do squats while I'm reading, holding the low position for several minutes at a time. For my own training, I most often do the squats from naihanchidachi, but it’s good to use other stances, particularly neko-ashidachi or variations of the basic cat stance, too. If the stance you employ is not bilaterally symmetrical, make sure you do them from both sides. And don’t drop that coin! The slower you move up and down, the better. The third exercise to develop basic strength and control, while also limbering up your torso, is koshi rotation. During the entire rotation exercise, you are, of course, also maintaining a constant contraction of the lower abdomen—squeezing that coin without pause, holding that Kegel for longer and longer, too. While performing this rotation exercise, be sure not to let your joints give way from arch to hinge. Mind the coin, too. It’s extremely important to remember that this rotation exercise is a gross exaggeration of the sort of motion to be used in the actual performance of a technique and delivery of effective power. Some instructors have dropped this exercise from the syllabus because too many students incorporate the big movements of the training exercise into the actual technique. This makes you slow and weak, just the opposite of what we’re trying to achieve. The fourth drill focuses on compression (primarily bilateral, but also radial) of the full torso, with the compression rooted within the pelvic carriage, expressed through the shoulders, and including all of the abdomen in between. In this exercise, we need to picture ourselves having to pass through a space not quite as wide as our shoulders (or waist, if that is your widest point). To get through this narrow opening, we want to avoid, as much as possible, turning our body sideways and instead try to make our body smaller via compression. The body, including the pelvis, is somewhat flexible and can be compressed to a certain extent. In martial training and technique, it's not really important to actually make the body smaller. We try to do this because it forces the torso to act something like a spring. By trying to fit into space that is smaller than our body, we compress the torso as a whole and the skeletal structure, muscles, and connective tissues separately. This has the effect of constructing a power load that can be triggered whenever we choose. We then channel that exploding power into our technique and ultimately into our target. If you have trouble with this full-torso compression, concentrate first on compressing the lower torso, the koshi. The rest of the torso will follow, even from the beginning, and as you get more proficient it will be easier and more natural to compress the whole torso at will. Koshi Basic Exercises from George Donahue on Vimeo. Stair walking is not only a good cardiovascular exercise, it’s one of the best ways to learn how to compress your koshi vertically. Once again, the emphasis in this exercise is maintaining arches rather than hinges. In the accompanying video, I've demonstrated this on the steps to my front porch, only three steps. To make this exercise work better, you need a longer staircase. You don't need to set aside a special time to do this exercise. Just do it every time you go up or down stairs. For me, that would be dozens of times a day. Still holding that coin, right? Once you’ve gotten the necessary control over your koshi, you can begin to apply your new skill to execution of your technique. For that, you’ll need some hands-on time with a good teacher.